An alternative to paying the event price is making an offering in the amount that you would like to give. A link to our Dana Offering page will be in your registration confirmation email. Lama Yeshe Zangmo, known as Lama Inge Sandvoss was born in Germany in 1939 and moved to the United States in 1958. She met Chagdud Rinpoche in Portland, Oregon November 1980. After several years of study, Rinpoche guided her through a 3-year retreat. Lama Inge is the first western lama ordained by Chagdud Rinpoche. Since 1987 she has been resident Lama of Chagdud Gonpa Padma Ling in Spokane, WA. She also travels and teaches at various centers in the United States and Germany, and has taught in Nepal. Public Talk: "Dharma 24/7", January 11, 2019. Lama Inge will give a public talk about bringing the Buddhadharma into one's everyday life. Everyone is welcome! Weekend Teachings: Feasts of Chod, January 12 - 13, 2019. 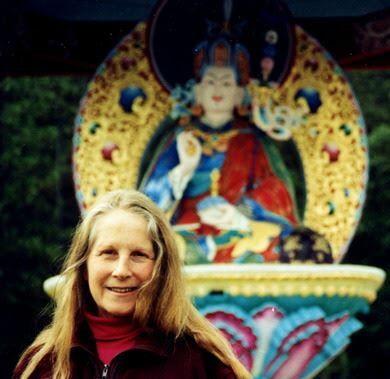 Lama Inge will lead the study and practice of Chod. Chod is the practice of cutting the ego by generosity. The practice text will be "Feasts of Chod" from the Cycle of the Wrathful Dakini, T'hroma Nagmo - a treasure of Dudjom Lingpa. No empowerment is necessary for Feasts of Chod. Everyone who has taken refuge is very welcome.